With the improvement of living standards, more and more people have more demand for jewelry. At the same time, there are a lot of people planning to open a jewelry store. The only thing is that they don’t know what to do, what step they want to make, and then they don’t understand how to do it. They only know that the industry is doing well. Let me showing a elegance jewelry shop for your meet , hope is helpful for your business . 1.More introduce about this jewelry shop . Color: brown , white . Material : MDF . stainless steel , glass . Service : jewelry , watch , glasses . You can see whole store is very modern ,Very clean and tidy , whole store is 100sqm , it’s a square shape . mainly for selling jewelry , watch , glasses . mainly material is flame retardant MDF , surface is white and baking painting finished . tempered glass display showcase with hidden led light strip. the front part of whole store with a big glass showcase , client can direct aw interior furniture and service . so here we using Short display stand . put jewelry showcase and glasses model showcase . Not only effectively use the space, but also maintain the overall beauty and experience . 2. How can i customized a shop like this one ? How long can you receive kiosk after ordering ? Kiosk design progress: 7-10 days . Kiosk building time: 15-18 work days . shipping time to port : 15-18 days . delivery time from port to mall :5-7 days . 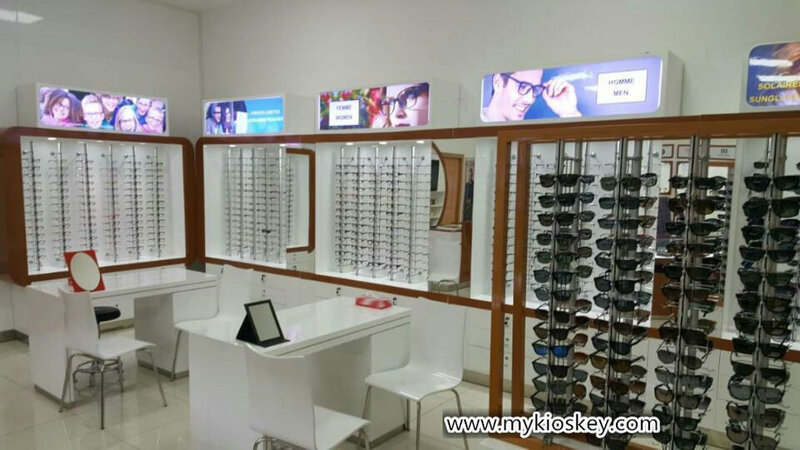 If you plan start your own jewelry display kiosk in mall ,First, position your project and identify the services you want to provide you need try find a good location in mall . Of course, most shopping malls have basic requirements for the construction of a cabinet . That’s why you have to find a professional design team to help you design and get approval from the mall . after get mall approved . you can start this project produce and start this business.